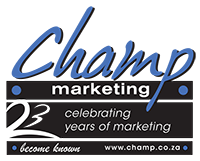 Events Page » Champ Marketing » 23 Years Young! either they have organized the event or they where contracted to do something at the event. If you would like to organize an event then CHAMP Marketing is the company to contact.